On May 8, 1999, at the San Francisco Center for the Book, I had my first experience with letterpress printing. I learned about the California job case, how to set type and prepare the press, and together with the other class participants, printed a chapbook under the imprint of the "created for the day" Tiramisu Press. In the years that followed, I took a few other printing classes in the same location, and every time I was reminded how much I like the blend of boundless creativity and tight concentration that goes into printing. Mary Dern's short piece titled Printing, therefore, resonated with me. As it is only one page long, I invite you to go to the Star 82 Review website and read it all. One of the fascinating things about not just printing but any form of arts is the special language each uses, a combination of unusual words (quoins anyone?) and common words given a special meaning (furniture). 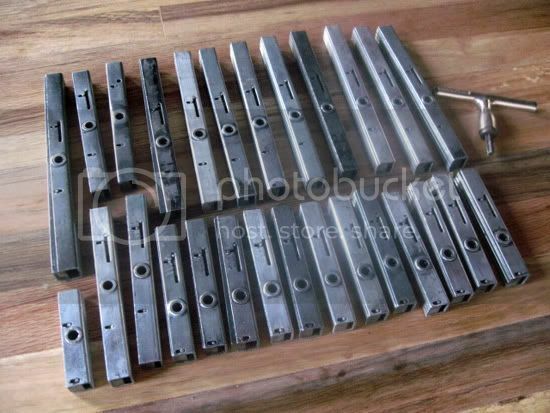 If you are not familiar with letterpress printing, I won't have you wondering: A quoin is "a wedge or expanding mechanical device used for locking a letterpress form into a chase" and furniture describes "pieces of wood or metal placed around or between metal type to make blank spaces and fasten the matter in the chase." 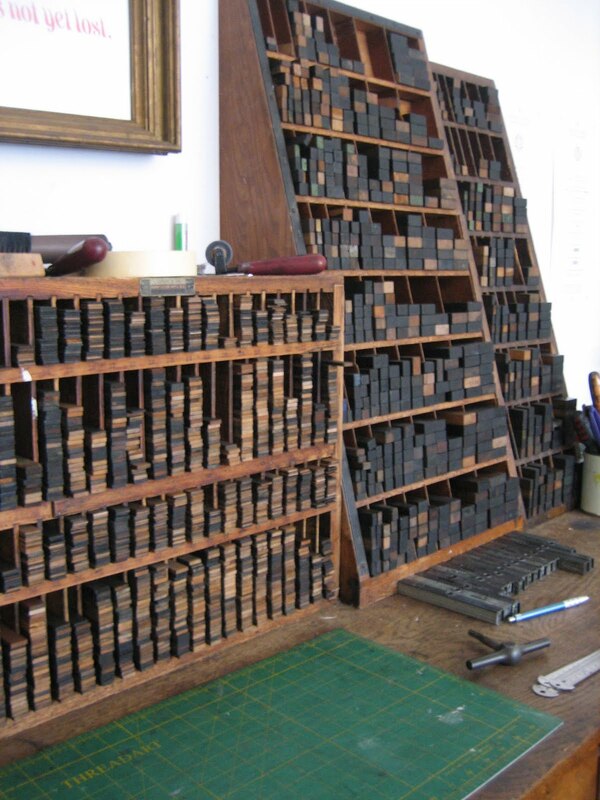 The chase is "a metal frame for holding the composed type and blocks being printed at one time" (Oxford Dictionaries). I ink the press. The ink in the can shines succulently; it is delicious, shining black. I spread some on the plate with my palette knife. The press runs, hums, a small ching of metal. The rollers move up and back and down and up and down, spreading the ink in a glistening sheen. The chase is locked in, the press starts up, the rollers ink the type. I feed the paper onto the platen, press the lever. The kiss. The poem. As soon as my eyes reached the final word, I started thinking about sheets and ink and printing. For the nth time I wished I could get my hands on some cuttlefish (seppie), whose black ink (nero di seppia) would have been a nice echo to the "succulent" printing ink. Alas!, no such luck and even finding unclean squid (i.e., squid with still the ink sac) is so complicated, I stopped trying some time ago. I have already made pink pasta and green pasta, so something different was called for. When I looked at my hand-cranked pasta machine, I realized that it resembles a printing press, though it does not click to signal the end of the run for its rollers. I was reminded of a class on relief and pressure printing I took some years ago and thought this would be the right time to try to make so-called stained glass pasta, so I geared into action. I chose petals from nasturtiums, which grow wildly in our garden. Using rose petals is more romantic and aromatic leaves may lend some of their flavor, but in terms of color, it is hard to beat nasturtium's petals. A mistake in ordering from King Arthur Flour means I am now the happy owner of a bunch of pastry blend, but an unhappy not-owner of pasta blend (note to self: check the order receipt carefully next time). Had I had the pasta blend, I would have used my normal egg pasta recipe, but since I didn't, I made up a blend with semolina flour and all-purpose flour, but I'll go back to KAF pasta blend as soon as possible. I have also made a batch of pasta using only egg white (albume) rather than whole egg: this makes a dough of a lighter color. On your working surface, create a well with the flour and crack the egg directly into it (or pour egg whites). Scramble the egg with a fork. Draw flour from the sides of the well into the center, mixing well with the egg. Trade the fork for your fingertips. Draw flour until a soft dough forms. Add more flour if needed. Continue to knead the dough, 8-10 minutes. Cover and let rest for an hour or so. Roll pasta by hand or with a machine. The basic idea is to roll the dough until fairly thin, then distribute the petals on half the sheet, then fold the sheet to sandwich the petals between two layers and finally roll again to preferred thinness. The first rolling can occur by machine or by hand, while the second, in my opinion, is better done by hand, as the rollers have a harsher effect on the petals. This is a personal preference. Cut the pasta in a shape that allows the person eating it to see the petals. I cut the pasta into maltagliati, one of the many variations on the theme of irregularly cut pasta. Maltagliati literally means badly cut. Usually this pasta shape is cut into lozenges (rombi). As precision is not required, different sizes of the pieces of pasta are acceptable. Lay out the pasta on a lightly floured surface. Cook and dress as desired. I did this in two ways. My husband having a cold and chicken soup becoming a daily menu item, maltagliati recommended themselves as being suitable for a steaming bowl of my chicken broth/stock. Bring the broth of choice to a boil, toss the pasta in it and cook until tender. Ladle into bowls, distribute some freshly grated Parmigiano-Reggiano on top and serve immediately. Bring a pot of water to a boil. Add some coarse salt (sale grosso), stir and then add the pasta. Bring water back to boiling. Cooking time depends on flour used and thickness of pasta, but it is in the order of a few minutes, so don't wander away. Depending on the kind of sauce you are using, you may need to prepare it ahead and have it ready at hand while the pasta cooks. In my case, I decided to use a bit of freshly made (regular) pesto, so I took an amount commensurate to the quantity of pasta, placed it in a bowl and thinned it slightly with some of the pasta water. When the pasta is ready, turn off the heat, pour a glass of cold water in the pot, stir and then drain the pasta, leaving a little bit of water clinging to it. Empty the colander into the bowl with pesto and stir delicately but thouroughly. Serve immediately. Final note: I read Dern's piece on the printed version of Star 82 review, a slender book that contains other jewels, like this illustration and this memorable short-short. This is my contribution to the 19th edition of Novel Food, the literary/culinary event that Lisa of Champaign Taste and I started some time ago and that I continue to host. The soup version of my maltagliati is also my submission for Souper (Soup, Salad & Sammies) Sundays, a weekly event created by Deb of Kahakai Kitchen. or launch the maltagliati con petali di fiori audio file [mp3].